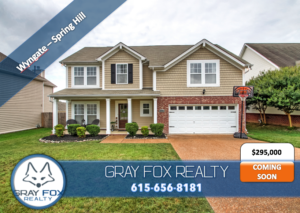 1806 Baslia Ln Spring Hill Tn 37174 located in the Wyngate subdivision is duper convenient to all the schools and local shopping. This home sits on a level lot and has great curb appeal. Inside is nice and bright with lots of natural light coming into the home. Recessed lighting and crown molding on the main level finish this home off nicely. Home is equipped with hardwood floors in the main floor living space. The kitchen opens to the living room allowing for everyone to be part of the fun. The master suite is nice and roomy and accented with a tray ceiling and crown moldings. The privacy fence out back is ideal for keeping pets close to home and for providing a buffer for the evening cookouts.